My husband and son are meat and potatoes kind of guys. 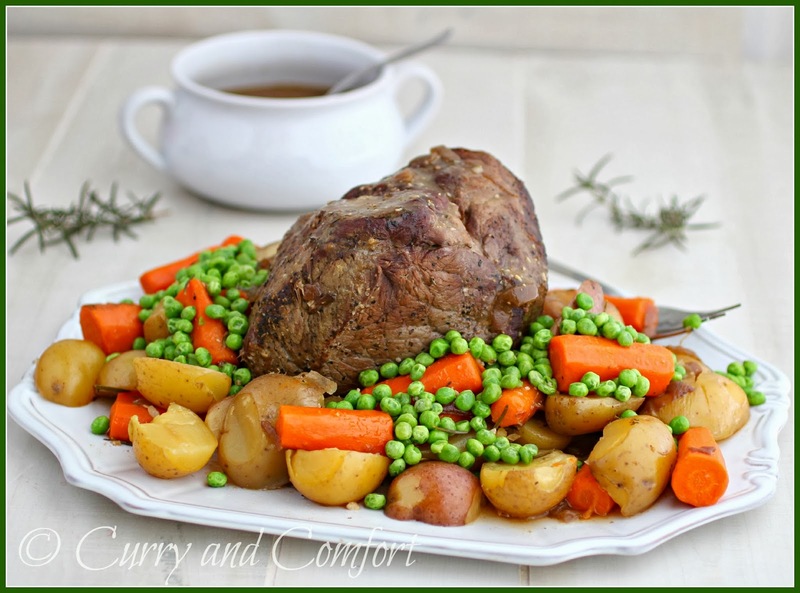 I found a lovely Angus beef roast at the grocery store and immediately thought of making them a pot roast for Sunday dinner. 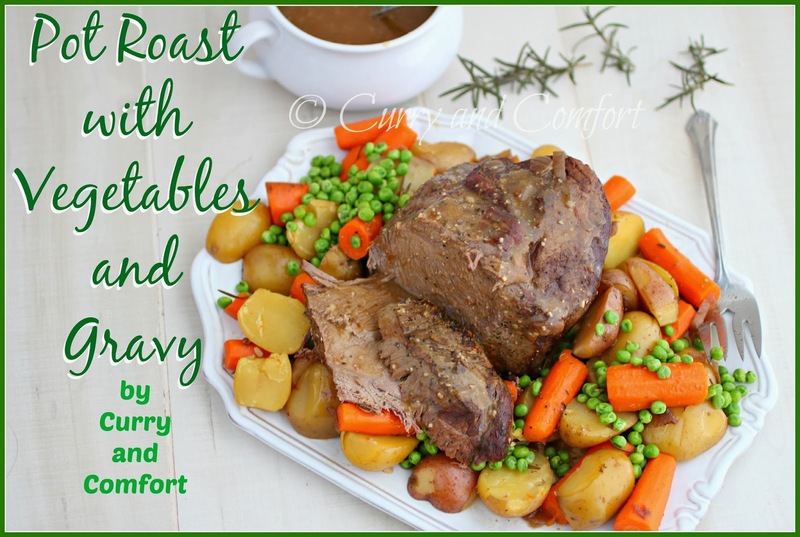 This roast was also easy on me because I decided to use the slow cooker to make it and let most of the work get done there. I only had to prepare the meat and vegetables which took about 10-15 minutes in the beginning of the meal and then thicken the gravy at the end of the meal. It was basically a one pot dish that scored big points with my family. Pat meat dry and season outside with salt and pepper. 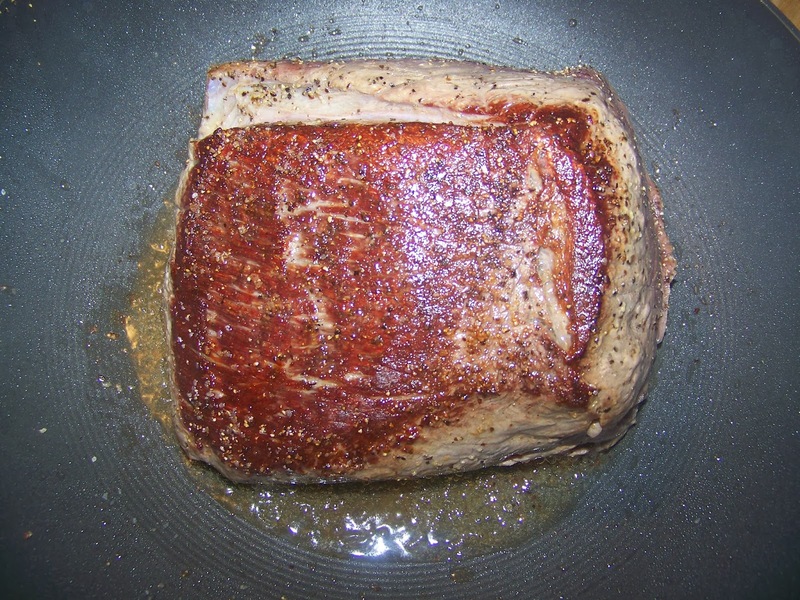 Heat 2 Tbs canola oil in a large nonstick pan and brown all sides of beef roast. 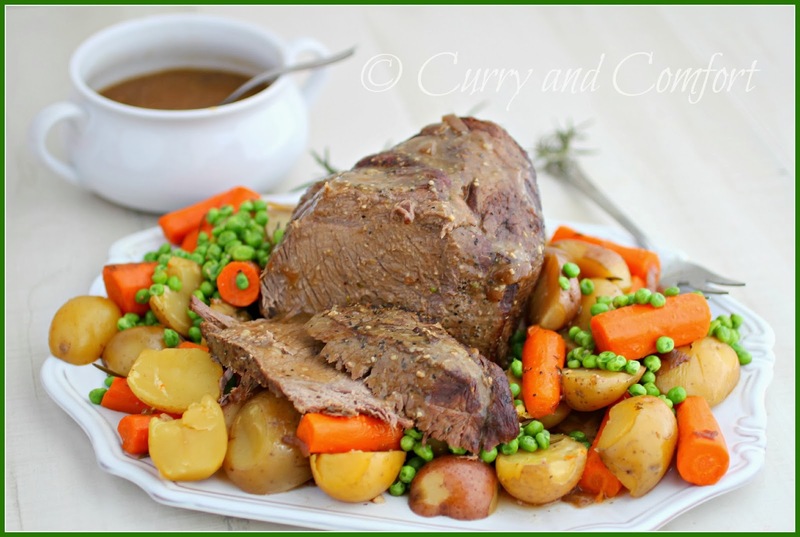 Place beef into slow cooker with prepared potatoes and carrots (do not add peas yet) and turn slow cooker onto high. 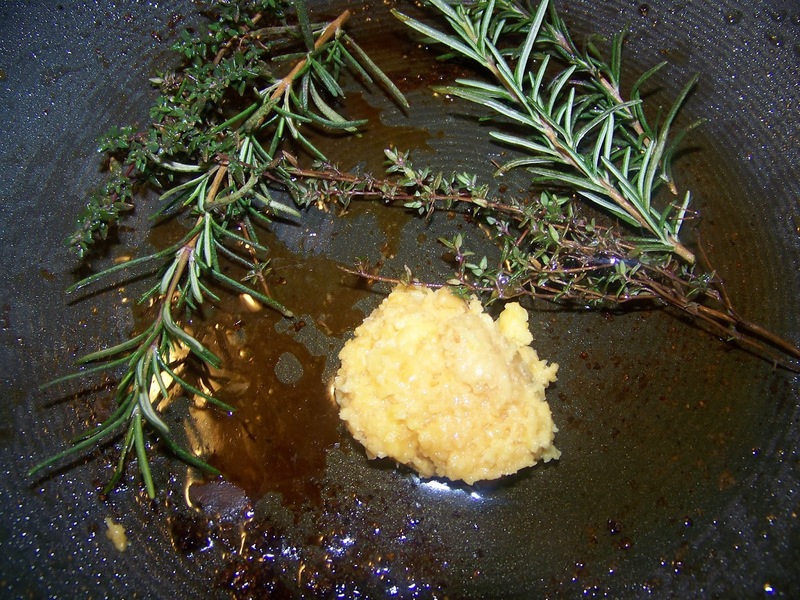 In pan with remaining oil, brown garlic and onion, then add rosemary and thyme. Next add onion soup mix and stir in water. Pour soup and sauteed onion/garlic mixture over vegetables and beef. 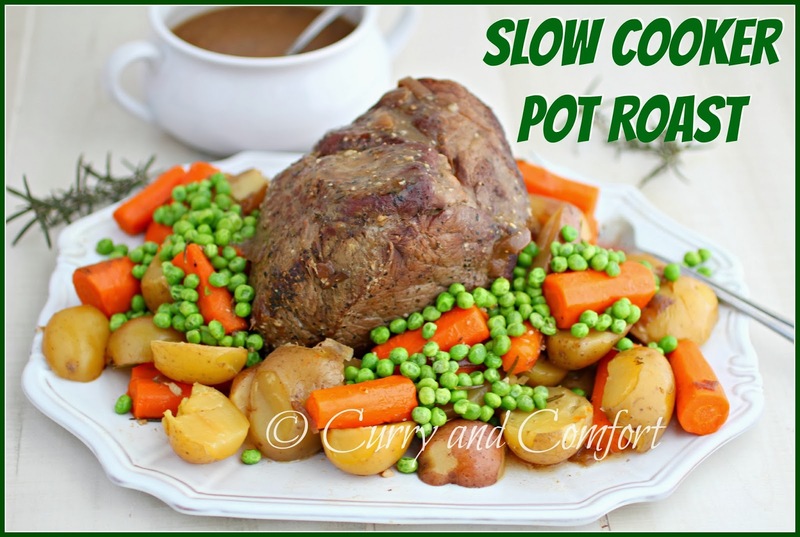 Cook in slow cooker on high for 5-6 hours or until beef is tender. Add peas in last 15 minutes of cooking. Remove all meat and vegetables onto platter. Skim the top layer of gravy into a pan (fat layer) and mix with flour. 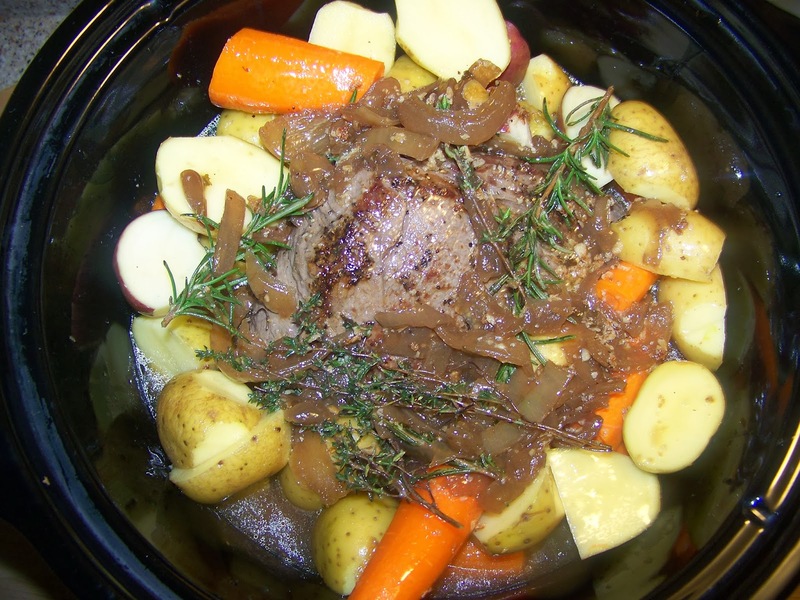 Keep adding gravy from the slow cooker and stir well until gravy thickens. Taste for seasoning adjust salt and pepper as needed. Enjoy. So hearty! I love it! Crock Pot love!!! This looks like the perfect Sunday night dinner. I want to come home to this meal... especially on a cold day. What a wonderful meal! You're such a wonderful cook, Ramona. I need to expand my repertoire!